Native to the Caribbean and South America, the Goldfish plant (Columnea gloriosa) blooms seasonally in the wild, but commercially produced cultivars can bloom more frequently. The most common flower colour is orange, but you may find yellow and red varieties. In its native habitat, this plant is an epiphyte; it grows harmlessly on other larger plants and trees. 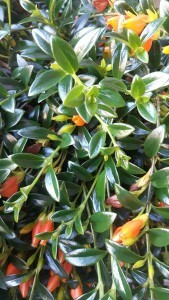 The Goldfish plant prefers bright indirect light. To promote flowering, allow it to dry out thoroughly before watering, and do not repot too often. It likes to be somewhat root bound and will produce more flowers this way. A high phosphorus fertilizers (such as 10-30-10) used monthly during the spring, summer and fall will also encourage flowering. To keep this plant thick and full looking, regularly prune back any long trailing stems. This will promote branching and new leaf production. The Goldfish plant looks great as a hanging plant. It can be a bit messy though, as the flowers will dry up and fall off. The plant prefers a humid environment, and will quickly drop its leaves if the air is too dry. This can be an issue in the winter when the indoor air loses humidity. Regular misting can help throughout the winter. Despite liking humid air, the Goldfish plant does not like to be kept too wet. The soil should be porous and well drained, and the watering infrequent. Spider mites can be an issue in dry air, as can mealy bug. Inspect regularly for pests.